You probably already know I am in love with my CrockPot. Yes, it’s true. Along with my Instant Pot, the CrockPot is an absolute life saver. Just being able to set it and forget it, then come home to a hot meal is a luxury that should not be taken for granted! Lately, I have discovered another reason to love the CrockPot. It is a great kitchen tool for helping you stick to your low carb diet. Perfect examples can be found in low carb CrockPot recipes with chicken. 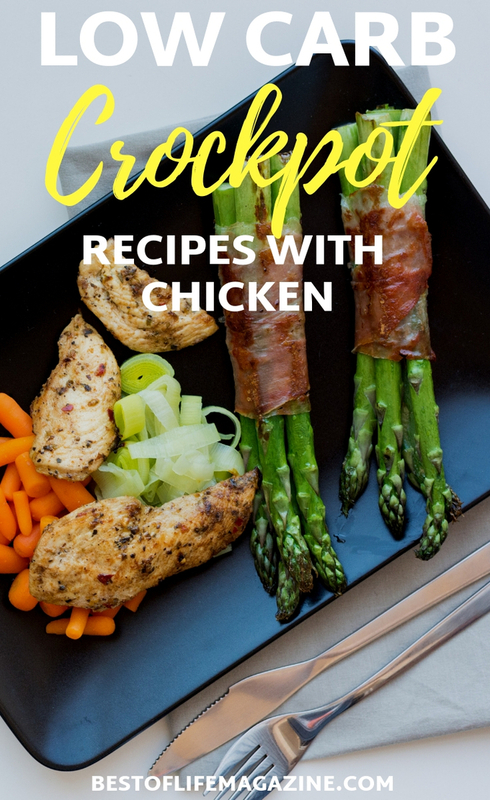 Having a CrockPot makes eating low carb even easier and low carb CrockPot recipes with chicken are great recipes to help you get started. 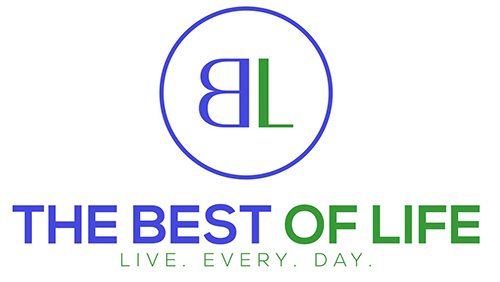 While there are a million different types of low carb diets out there, a widely accepted daily carb intake of fewer than 150 grams is considered to be low carb. Some are drastically lower and for many reasons, you may choose a range that suits your dietary and health goals. Eating within this generally-accepted range can help you achieve all kinds of health benefits as well as weight loss. Eating low carb means making the right choices when it comes to the rest of your diet too. Choosing healthy proteins and fats, and making your carb choices come from vegetables and unrefined starchy foods is the best way to feel full and satisfied. 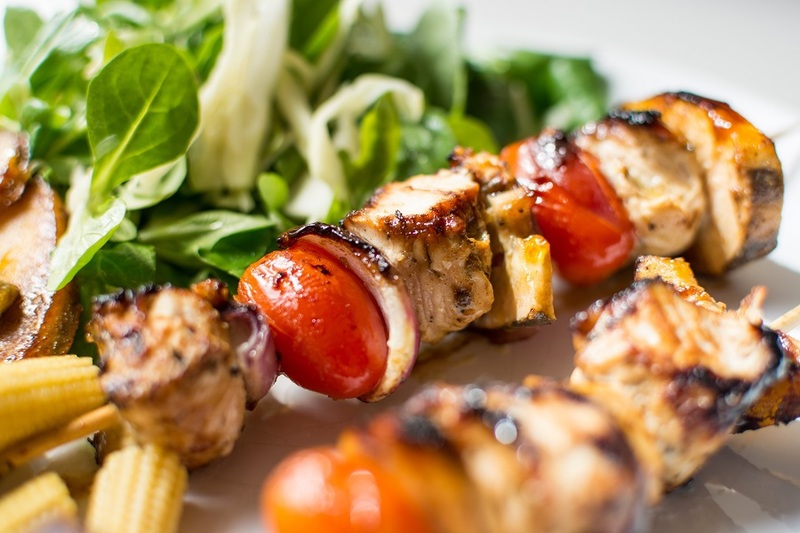 Chicken is one of the best protein sources for low carb dieters since it is lean and versatile. Here’s where your CrockPot comes into the picture! There’s no need to eat tasteless, rubbery, grilled or broiled chicken day in and day out when you can slow cook a juicy low carb meal that is flavorful and filling. 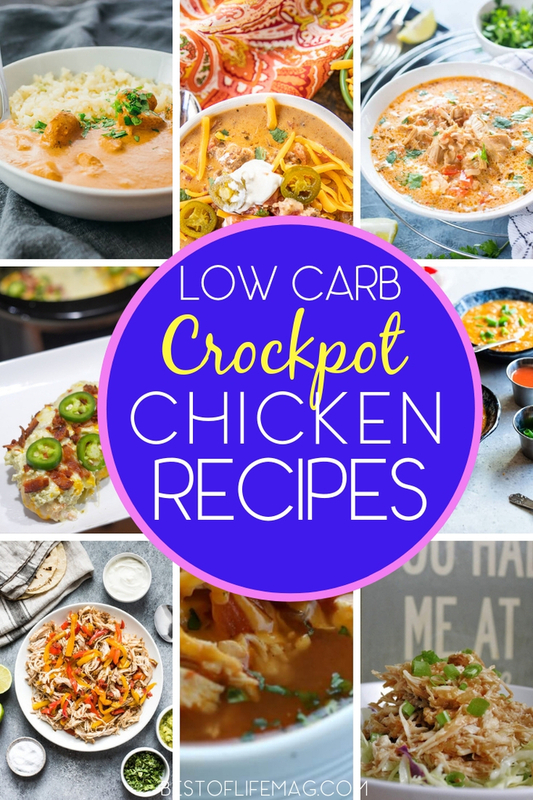 These low carb CrockPot recipes with chicken will give you just that, and they are perfect for meal prepping too! There are many ways to use chicken in low carb recipes, many of which are healthy and delicious. Many recipes can be altered so that they fit your personal needs (although, we personally think they’re perfect just the way they are).